← Beam me up, Scotty!… or Kinect meets Makerbot. Given my great experience with the original kit, I backed this project in Kickstarter. As a seasoned kickstarter backer, I’ve seen projects some delay forever and fail to deliver and others success and provide a great product (for example, openbeam). You never know what to expect when you back a project. Paul from Litiholo has proceeded admirably, with a reasonable delay, and has delivered a product really worth considering, though not lacking some minor flaws. I know some backers are still waiting for their kits and they think shipping is going too slow… if this helps them, delivery time is in the average for successful projects in kickstarter, and more importantly, the kit is worth the wait!, and they really want to get a fully tested and funcional kit. I have uploaded tons of photos of my first tests in my flickr page, with comments and details of the kit contents, set-up and the like… If you want more information than what is provided here, refer to those photos and their comments. This is what you get with the kit: a red diode laser, a blue diode laser, a green dpss laser, some plastic pieces that snap together to create a single-beam set-up for reflection holograms (and hopefully transmission), the holographic plates where the holograms will be recorded, and an additional special plate: a ‘holographic optic element’ (HOE) to be used to combine the three laser beams into a single one. This hologram is pretty sharp, considering that I did not use any type of vibration isolation, just made it on a regular sturdy desk table. I got a nice reflection hologram at the very first try. Color! Hey, you get three lasers! 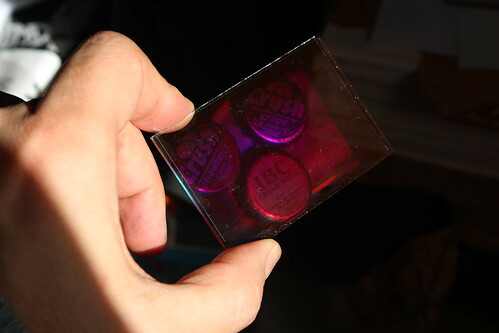 Great for schools, demonstrations or plain fun: you need know nothing about holography to make it work. I think it makes a great tool for amateurs like me also, to quickly test more complex set-ups, because it removes two variables from the equation: exposure time and processing. The kit only allows a limited set of configurations. The beam profiles for the three lasers cannot cover the full plate. The kit material is fragile, be careful not to drop specially the laser holders… maybe thicker material should have been used. In conclusion, if you know the original kit, this one keeps the same approach, only in colors… if you liked it, you should love this. If you didn’t, well… you could give it a chance to get some color! If you do not know the original kit, this one makes a great choice, since it actually allows you to do the same it did, and then some. I really like the kit, and if you are curious about holograms (real holograms, no false hype here) I wholeheartedly recommend it, even though some tweaking in the lasers profiles and plastic material used could improve it. After all this is a beginners kit, and that should be kept in mind, and you get panchromatic plates and three lasers!, you can use this material to try more adventurous set-ups once you master what the kit has to offer. 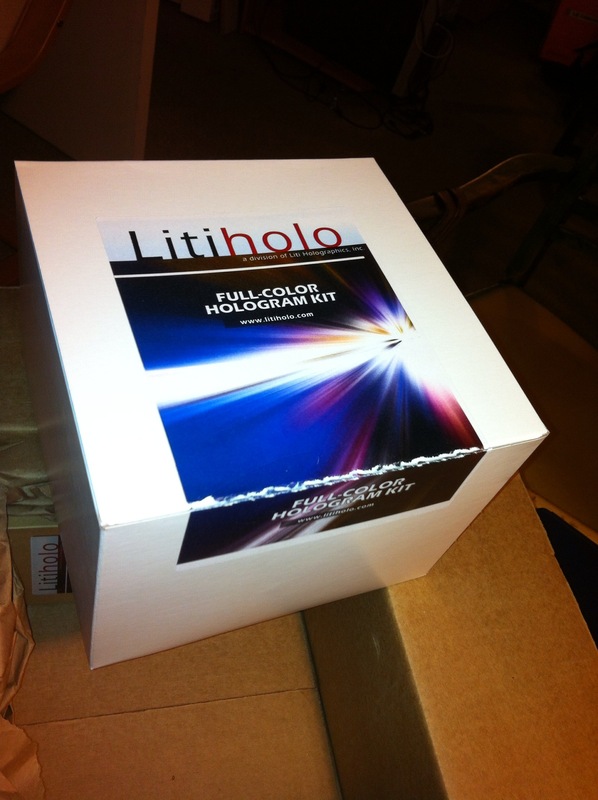 Keep in mind that when you read this the kit might not yet be widely available… just keep checking litiholo’s site. 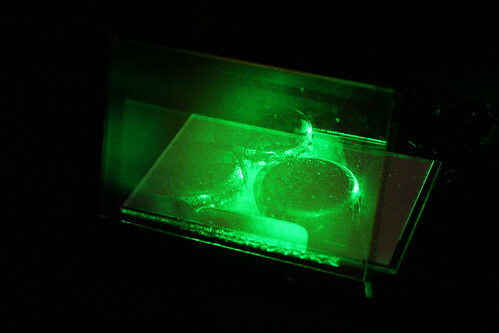 This entry was posted in holography and tagged full color, holography, litiholo, projects, reflection, reflection hologram, reflection holograms, transmission. Bookmark the permalink.